For the next few months, ABC isn't airing a show about "The Bachelor." It's all about "El Bachelor," as the reality show's latest seeker of life-long love, Juan Pablo Galavis, likes to call himself. The usual method for introducing the contestants - a grand limo pulls up, and out steps a woman fully made up in her best evening attire - went mainly without a hitch, although there's always at least one person who tries out a "unique" way of standing apart. This season, that woman was Clare, who showed up pretending to be pregnant as a joke. An odd choice for sure, but apparently it worked: "I LOVED IT," Juan Pablo enthusiastically blogged on People.com after the show. "When I saw her step out, I was like, 'OMG' but after a second and seeing that kind of weird shape on her belly, I was like, 'Ohhh, good one.'" It probably helped that it was an easy way of remembering who she was, since JP (as we'll call him) claimed that "after the first half of the girls, I was a MESS because they were all so beautiful that I already lost track of them!" Although another woman, Lauren, tried to woo Juan Pablo with her talent - she made her entrance on an ill-advised piano bike - it was opera singer Sharleen who made a stronger musical impression. "Sharleen came all the way from Germany to meet me! I was so impressed by her beauty, by her job as an opera singer and that she tiene mundo/has worldliness," Juan Pablo gushed in his blog post. "I absolutely do not regret giving her that rose because I really want to spend more time with her – plus I can't wait to hear her sing." 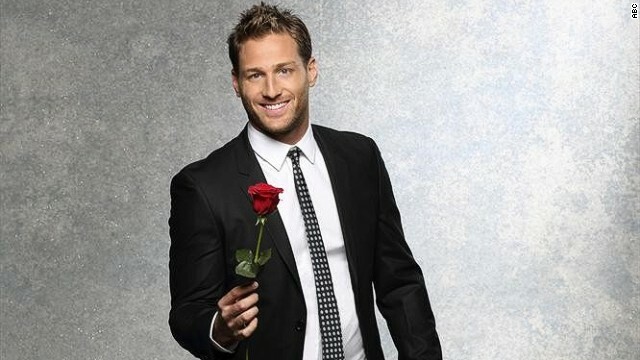 As sweet as he is, Juan Pablo did have to break a few hearts on Monday night. One of them was Kaylie, a 23-year-old interior designer who mistakenly thought she heard him call her name - only to realize he was giving the rose to someone else. "I almost died because I felt so bad," Juan Pablo said. "I hope some day she forgives me." That's not the only apology he's handed out. On Twitter, Juan Pablo encouraged another spurned contestant, Lacy, to keep looking for love. What did you think of the new El Bachelor? Ratings show ABC's "Juan-uary" is off to a solid start: Monday's premiere was up 17 percent from last January, making it "The Bachelor's" best debut in three years. He is so boring, and so is Shawn who is getting married on tv this week. The bachelorettes should not cry over these clowns they are nobody. just men. I'll watch when they have a Black bachelor. Now that will be good. I'm watching for the drama but am seriously underewhelmed by Juan Pablo. not interested..that's how I am. He looks like a Ken doll(in the first picture). Blondes are not my type but he is attractive. So, the cat is out of the bag. It was revealed today that Juan Carlo is a deadbeat dad where paying his child support is concerned. Not sure that your source for this statement is reputable. He has custody of his daughter, and it is usually the noncustodial parent who pays child support, not the parent who feeds, clothes, and takes care of the child's needs on a daily basis. Laura – His wife has custody of their daughter. While she and Juan have a good relationship she was forced to take him to court to collect owed child support. His salary has been garnished by the court. Who is Juan Carlo? You must be commenting on the wrong article as this is about Juan Pablo. He's pretty cute. I'd do him. Not me. I don't care for his hair. I think it makes him look sneaky. Frijoles pintos son muy buenos. He was born in NY, grew up in Venezuela where his parents are from. Lil Webster is all grown up. we can't say the same about you, nuisance troll. I already told you are not Lil Webster even if you look like him. Stop looking at the mirror. Firsty the Snow is time for your medication and get a colorblind test.Remember you are not Lil Webster.